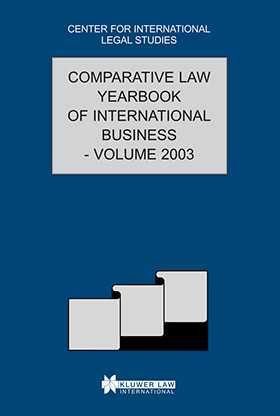 The 2003 volume of the Comparative Law Yearbook of International Business deals with a variety of topics in the field of commercial law. These range from mergers in Nigeria and joint ventures in Thailand and Hungary to the fight against corruption on an international level, as well as corporate fraud in the United States, with attention being focused upon the new Sarbanes-Oxley Act of 2002. Some authors have dealt with subjects that involve finance, such as foreign investment in e-commerce in China, employees¿ stock purchases and option plans in the United States, pension funds in Nigeria and preferential tax regimes in Madeira. There is also a review of the Agreement on Trade-Related Investment Measures. Other popular areas of commercial law that are covered in this volume include consumer protection in Bulgaria and alternative dispute resolution. Arbitration in Paraguay is discussed, along with the conducting of mediation by legal professionals. In addition, European Union law arises in relation to the likelihood of association, with another chapter detailing the economic association between Mexico and the European Union. The Commentators in this book are leading professionals in their respective fields and the interesting mix of topics should be of value to those involved in business in the international arena and their legal advisers.